I spent all my elementary school years in the 60's and listened to a lot of WABC-AM and WMCA-AM radio. While there was plenty of great pop and rock music, I dropped right into the whole bubblegum music craze of the late 60's/early 70's. I could not avoid it and frankly, it was hard to resist, which is exactly what all these record producers and labels wanted. I bought the singles by acts who were merely fictitious vehicles for these music executives to sell their acts. I thought they were real like everybody else! How do I define bubblegum music? Under three minutes, "teenage subject matter" (usually girls), an element of silliness, simple chord structure, repetitive to the point of surrender. The song could be highly produced with horns or strings (Spanky and Our Gang's "Sunday Will Never Be The Same"), or garage-type rock (Any song by the 1910 Fruitgum Compnay or Ohio Express). 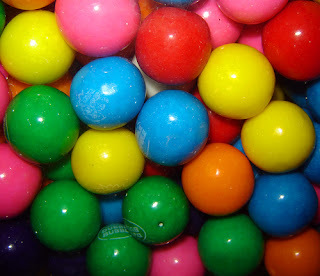 What is all the boy band music and Hanna Montana but modern variations on bubblegum music? Sixties bubblegum was particularly unique in that the group names were ridiculous, especially the ones tied in with Saturday morning cartoon shows (The Wombles? The Cattanooga Cats?). Even the "boy detectives" The Hardy Boys had a bubblegum band (Frank Hardy on guitar, Joe Hardy on bass!). You also had the same producers coming out with different songs under different names, often with the same lead singer (Ron Dante sang lead on all The Archies songs, and then did the same on The Cuff Links "Tracy"). For further reading, the book on the topic is absolutely "Bubblegum Music Is The Naked Truth," still in print, with contributions from my west coast friend Becky Ebenkamp (check out her radio show here). For a modern appreciation of the genre, you must buy the fantastic power pop tribute Right To Chews. I make no apologies for being a big fan of bubblegum music, especially when one consider The Ramones based a lot of their songs on the same catchy simple chord patterns, and even covered "Indian Giver" on their Ramonesmania compilation? You're telling me that the Cars didn't consciously rip off the beginning of "Yummy Yummy Yummy" for their first hit "Just What I Needed?" 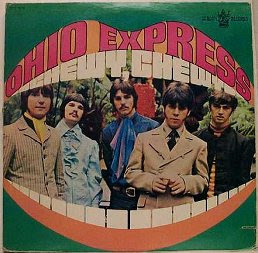 1) Ohio Express -- "Chewy Chewy" (1968): This is the first bubblegum single that I had to buy. I was at a sixth grade party at some kid's house, the boys on one side of the room and the girls on the other, and somebody put this single on the phonograph. That was it, it was all over for me. The singer had this nasal quality to his voice, almost like he was holding his nose while singing the song. And for a sixth grader standing on the other side of the room from the girls, it was easy to dance to, as bad as my floor moves may have been. The Swedish power pop group The Yum Yums (how's that for a name?) did a heavy electrified cover of the song in the late 90's. 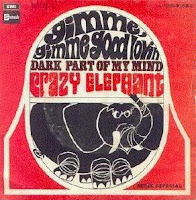 2) Crazy Elephant -- "Gimme Gimme Good Lovin'" (1969): I always thought they were called the Crazy Elephants, but their name turned out to be similar to Iron Butterfly. What is this song, two minutes? Driving beat, the trademark cheesy Farfisa organ, three chords! One of my absolute favorites, the first song I ever did in my home recording studio, and covered with drum machines and samples by cult producer Mitch Easter on the aforementioned Right To Chews record. 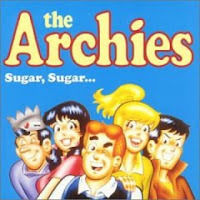 3) The Archies -- "Sugar Sugar" (1969): Let me quote Wikipedia's entry on the band... "The Archies are a garage band founded by Archie Andrews, Reggie Mantle, and Jughead Jones, a group of adolescent fictional characters of the Archie universe, in the context of the animated TV series, The Archie Show." I'm surprised they didn't refer to him as "Reginald Mantle." This first big hit by The Archies stayed at #1 for what seemed to be an eternity. Another song with just a few chords, a nicely distorted electric piano playing the chords, and what seems like a black soul singer's voice coming out of Betty's or Veronica's mouth! 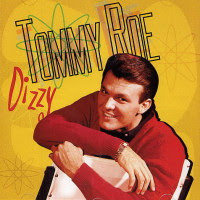 4) Tommy Roe -- "Dizzy" (1969): Probably the most complex bubblegum hit of the era. The song changes key seamlessly about three or four times for each verse and chorus, and because of that, has this sort of "merry go round" feeling. Certainly memorable for that shuffle-beat drumming throughout the song, including a couple of solo breaks. Another great cover on Right to Chews, the one by Cliff Hillis, who uses distorted samples, synthesizers and a toy piano. 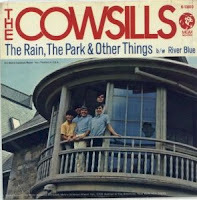 5) The Cowsills -- "The Rain, The Park and Other Things" (1967): Discussed at length on a previous post. A three-minute "teenage hippie symphony." 6) The Cuff Links -- "Tracy" (1969): Gee, why does Archie Andrews from the Archies sound remarkably similar to the singer of this single? Ron Dante overdubbing himself many times over for a ridiculously catchy song that also pushed the bubblegum envelope by changing keys several times. If there is any song that is a tribute to Dante's brilliant vocal skills, this is it. 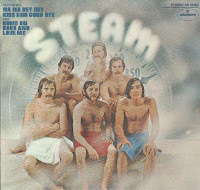 7) Steam -- "Na Na, Hey, Hey (Kiss Him Goodbye)" (1969): Strangely, the one hit wonder that has had the longest-lived life, thanks to modern day sports. The song also marks one of the first successful uses of drum loops. Word has it that this song was made as a goof and the lyrics were never meant to be what they were. Yet, when you combine repetitiveness, catchiness and a good gimmick at the break (repeating the chorus over and over at low volume, building it until it's normal again), and oh yes that awesome drum loop, flukes do happen. 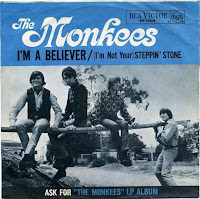 8) The Monkees -- "I'm A Believer" (1966): The ultimate real life bubblegum rock group, where auditions were held to create this group from scratch and go on to do a successful TV show, concert tours, albums and singles. The group members rebelled at one point because they wanted to play their own instruments and write their own songs. But this early hit written by Neil Diamond cemented their fame with another great fuzzy electric piano line, a country-type guitar lick, and Micky Dolenz' fun vocals. Smash Mouth's cover has nothing on the original. 9) The 1910 Fruitgum Company -- "Simon Says" (1968): Not exactly the most threatening sounding band name. I can picture the production team sitting in their offices coming up with the brainstorm of taking the kids' party game and turning it into a silly simple song. They took it all the way to the bank. At a time when there was the Watusi, the Twist and the Pony, it doesn't get anymore blatant than: Put your hands in the air, Shake them all about, Do it when Simon says, And you will never be out. 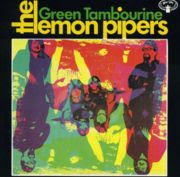 10) The Lemon Pipers -- "Green Tambourine" (1968): This is the biggest bubblegum hit which delved into psychedelia. Scratchy violins going up and down, prominent sitar playing, and weirdly echoed and altered vocals on the "Now listen while I play-y-y-y-yy." THE OHIO EXPRESS -- "CHEWY, CHEWY"
THE CUFF LINKS - "TRACY"
THE MONKEES -- "I"M A BELIEVER"
THE LEMON PIPERS -- "GREEN TAMBOURINE"
Thông điệp bạn chia sẻ tui cảm nhận ý nghĩa, chắc phải lưu lại xem tiếp. Sẵn đây tôi muốn hỏi bên cậu có nhu cầu vận chuyển hàng đến Hà Nội hoặc chuyen hang di Sai Gon không vậy? Ngoài ra bên mình cũng chở thang may gia dinh loai nho, thang máy tải khách mitsubishi từ HCM để vận chuyển hàng đi Campuchia, chuyen hang qua Lao hoặc van chuyen hang sang Trung Quoc. Có gì pm cho tui, cảm ơn bạn nhiều nhé.